This segment is a work-in-progress. If we are successful, this will be our common anchor and main goal in holding all parties together. Pantai Hill Watch will continue its efforts to ‘watch’, even when we fully commit to the common goals proposed in the ‘Community Agreement’. The draft below was initially proposed by the efforts of The Dusun. We propose strict limits on the commercial activities that already exist, to regulate ourselves, so that resorts create ZERO NUISANCE to residents. All development by any lot owner must be sustainable and does not put pressure on limited resources of water or damage the existing infrastructure of roads, drains, electricity and cause erosion or flooding. Existing resorts must be very low density and exclusive. We look out and help each other in-line with community spirit. A certain number of people per acre. Guests must be informed BEFORE THEY BOOK that this is a place for peace and quiet and shouting and loud music is not tolerated. This information must be up front on the website and included in the booking letter. Guests must be informed on arrival or by way of signage on site that you do have neighbours. This simple knowledge will encourage most people to respect the natural tranquility of the area, and the neighbours and their privacy. Owners who book guests must be in control of how they behave. If they are not resident themselves, they must have a resident manager with sufficient authority to supervise them. Hill cutting is discouraged. Road building into individual lots must incorporate adequate drainage and retaining walls where necessary. Construction sites will follow drainage and silt controls as per the usual requirements of drainage and irrigation department. Construction which bares the laterite soil, must be rapidly replanted with cover crops and landscaped with trees. Damage to community property, like roads and drains, by heavy machinery, must be repaired by the owner responsible. Construction debris should be cleared from public spaces. Open burning in the dry season is not allowed. Open burning at any other time must be monitored. No burning of plastic, rubber and other noxious materials is acceptable. Use of fireworks, fire lanterns, etc is prohibited. There is no municipal rubbish collection for Pantai Hills. This means residents are responsible for their own waste disposal, by composting, mulching with green waste or burial. Waste which cannot be composted should be bagged and sent to the tip behind the bus stop at Pekan Pantai. 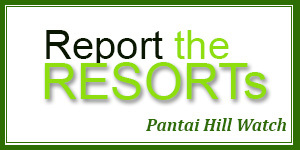 Pantai Hill’s residents and resorts should NOT dump rubbish on the roadside or onto river banks. Cars share the Pantai hills roads with walkers and pets. All resorts must have off-road parking, limit the number of guest cars and advise guests to drive slowly. This includes appropriate, low rise building styles, conservation of energy and replanting of trees/green cover destroyed in the building process. The use of chemical pesticides and herbicides should be banned (natural ones minimised). Resorts who take guests into the Forest Reserve should ensure that no rubbish is left behind and no plants removed. Neighbours who are sharing water with the community must comply with water rationing measures taken during the dry season. Resorts should have their own source of water and storage tanks for use during the dry season. Maintaining the water supply requires a great deal of time, money and energy. Water is not limitless.